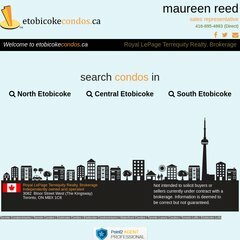 Topics: North Etobicoke, Central Etobicoke, South Etobicoke, & Real Estate Marketing. etobicokecondos.ca Central Etobicoke Condos for Sale | St. Andrew on the Green | 9 ..
etobicokecondos.ca South Etobicoke Condos for Sale | Hearthstone by the Bay | 3 .. It has 2 DNS records, ns2.point2.com, & ns1.point2.com. Yardi Systems Inc (Pennsylvania, Philadelphia) is the location of the Microsoft-IIS/7 server. The programming language environment is ASP.NET. PING portal.point2.com (216.245.139.209) 56(84) bytes of data.